This week, with #SNSCOLOUR, I’ve been trying to showcase some of the big trends colour wise, that are carrying over from Summer into Autumn/Winter 2016. Some colours and styles are perennial Autumn favourites though, as they tend to be brought out at the end of Summer every year to transition us wardrobe wise to the cooler months. And for the last couple of Autumns, grey, tan/camel and khaki have featured strongly and consistently. In my mind, these three colours are the “other” neutrals besides the usual black and white. They pair up nicely with a lot of other colours (particularly grey and tan) but are a change from the usual suspects, and for many of us, represent a more casual neutral as well. They also all work well with denim and black which tend to form the base of many of our Winter wardrobes. So when I see a fresh drop of fashion in these colours, I always take a good hard look at what’s on offer and think carefully and strategically about what’s going to work for me this Autumn/Winter and beyond. I don’t buy a lot but I usually buy one or two pieces that tend to get worn year after year. Last year, I bought a beautiful long line waterfall merino cardigan from Trenery and a woollen gilet from Witchery, both in grey, that I look forward to wearing again as soon as the weather turns. I’ve found by doing this every Autumn, I’ve built a great wardrobe of transitional, investment pieces over time. CLOCKWISE FROM TOP LEFT: Fedora, $79.95 from Country Road; Long Sleeve Gather dress, $149.95 from Witchery; The Perfect Poncho, $69.95 from Birdsnest; Scarf, $34.99 from Forever New; Boxy Grey Tee, $15 from Target; Leeza in Tan Suede, $229 from Style Tread; Slouch Pants in Khaki, $39 from Target; Long sleeve wrap coat, $299 from Seed Heritage; Soraya Felt Heel, $179.95 from Country Road; Ella Skirt, $89.90 from Boden. I love the idea of hats more than the wearing of them (I have hat-hair-o-phobia), but I love the colour blocking here – the grey/camel/black combo is a great look in my fashion book. If this Witchery dress looks familiar, I featured (and subsequently bought) the Summer navy version which I featured in this post last Spring. I really love this style, so when I saw it in this muted olive tone I just had to try it on in store. I found this Autumn/Winter version is a slightly neater fit (although maybe that’s a Summer of wine and cheese catching up with me), so perhaps try this one on in store or consider sizing up if you’re ordering online. As for ponchos, scarves and tees, you can’t go wrong with any of these styles which are easy to pair with jeans, soft pants or jeggings. I’ve also included a pair of soft pants which are easy wearing with a tee or denim shirt. If you’re after a pair of khaki jeans, check out these Side Pocket Jeans from Country Road – I’ve got the navy and black versions and they are great every day jeans. In the shoe department, I’ve tried to find styles which are a new take on a classic. These grey felted heels are the bomb dot com and I’d have no difficulty adding these to a corporate/office wardrobe. I’m currently rather partial to fringing too and these suede ankle boots add a bit of boho into the everyday while still being a practical addition to any shoe-drobe. I’ve also included this cute tan Boden skirt and statement coat from Seed for something a bit different from the usual denim or black offerings. I particularly love tan and camel tones worked back with cream or black for Winter and both of these pieces would be excellent additions to any Autumn wardrobe. 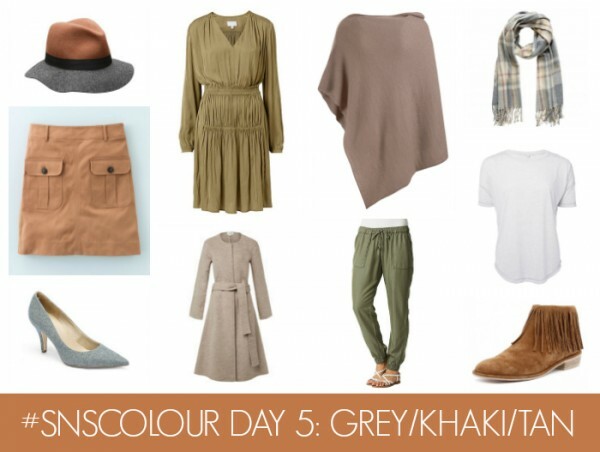 What’s your go to of grey, tan and khaki? How do you like to style it?